Valuation Software Offered Though MBAnalysis. The MBAnalysis Valuator PRO Software provides the serious investor tools to assist in refining investment decisions. We have developed methods that combine fundamental and technical analysis to accomplish that goal. MBAnalysis Valuator PRO Software covers a broad spectrum of more than 1800 investment possibilities ranging from well known, large capitalization-international corporations, to medium capitalization companies, to small innovative special niche companies. Whether you are a conservative long term low risk investor or a high risk aggressive trader, MBAnalysis Valuator PRO Software could help you achieve your investment goals. For Windows Vista, NT and 95-2000: From the START menu, select RUN. 3. In the Command line box, type the letter for your computer's floppy disk drive (if using floppy disks) or CD ROM drive (if using the CD), followed by :\VALPRO32\SETUP (for floppy A:\SETUP or for CD-ROM D:\VALPRO32\SETUP). 4. Your Data Will Be Updated To The \Program Files \VALUATOR PRO Directory. When you first start the Valuator Pro, the Control Center Window is Opened and A default calculator window is presented. The are some tasks that may only be performed from the Control Center Window. To perform these functions, all windows in the control center must first be closed. After all windows in the control center have been closed, you may perform the following tasks. Create New Database: Creates a NEW DATABASE for user data entry. The database will contain a single default record for you to Open and Add To or Modify. This is the best way to create a NEW EMPTY DATABASE. Clone Database: Clones and EXISTING DATABASE creating AN EXACT DUPLICATE. This is useful for preserving a Backup Copy of an Existing Database, Before modification or to Preserve the Existing Data For HISTORICAL use at another time. You Must Choose A Different Name than the source file For The Database Clone to be created. Calculator (New): Selecting the Calculator Icon, Or New From the drop down menu, will open a new calculator window using the Valuator default database. At that time, you May open another database for the window by selecting the Open Database Icon or by selecting Open Database, From the DATABASE drop down menu. See Getting Started With The Valuator Pro or Using The- VALUATOR PRO SOFTWARE - And Valuation Model for details on Using The Calculator. Lookup: Selecting the LookUp Icon, Or Small From the drop down menu, will open a new LookUp window using the Valuator default database. At that time, you May open another database for the window by selecting the Open Database Icon or by selecting Open Database, From the DATABASE drop down menu. See Getting Started With The Valuator Pro or Using The- VALUATOR PRO SOFTWARE - And Valuation Model for details on Using The LookUp Window. View Data Input:Will also Make Visible the Data Input Area of the Valuator. You May Change the Input assumptions for the Calculation. View Full: Will allow the User Access to all the input and output areas for changes to the security. View Small:Sets the window to the default size for quick LookUp and Valuation results. Screen: Opens The Screen-Filter Window. From here you may perform SELECTION AND FILTERING on the connected database. See SCREENING THE DATABASE or SELECTION SCREEN WINDOW for more details on using the Selection and filtering Criteria. Open Database: Used to connect the current ACTIVE window to a specific database. Update: Opens the UPDATE MANAGER Window. From here you may perform UPDATES on any Database. See Using The UPDATE MANAGER for more details on using the Database Manager to maintain your data. Export - Print: Opens the EXPORT - PRINT Window. From here you may perform OUTPUT on any Database. See Using The Export - Print Functions for more details on using the Export and print functions to Output HTML files For WWW Publication, Print to A FILE Or Print Reports To The System Printer. Status Bar: The bottom of the Control Center window contains the status bar. The status bar will contain information about operations currently under way that may require the user to wait for completion before proceeding. The status bar will show the progress of actions by displaying a red Progress bar as the operation proceeds. Please wait until the READY message appears before continuing with operation. The Progress bar is located at the bottom of the main Valuator Pro Control Window, It will indicate the progress of calculation operations which the system is in the process of performing. For proper operation the Red Needle Gauge should fill from left to right as the operation proceeds. Calculator And LookUp Windows: Valuator Pro Calculator And Lookup Windows Function in nearly identical manor. The Primary difference is the manor and presentation of the data. Auto Cursor: Auto Cursor Selects a Data Input Field on Any Calculator or LookUp window when the cursor is moved over the box containing the Input Field. This option is enabled by default when checked. UnCheck this option to disable Auto Cursor. If auto cursor is disabled, you must place the cursor over the data entry box and click to enter data. Auto Activate: Moving your pointer device across a Visible Data Entry Field on any Calculator or LookUp Window will Activate that window and Select that data Entry Field. This is a Rapid way of moving between multiple Calculator and LookUp Windows. You may disable this function by Un-Checking the Auto Cursor Check Box. This will affect only the window that is disabled. Any other window that is still enabled will continue to function in Auto Cursor Mode. 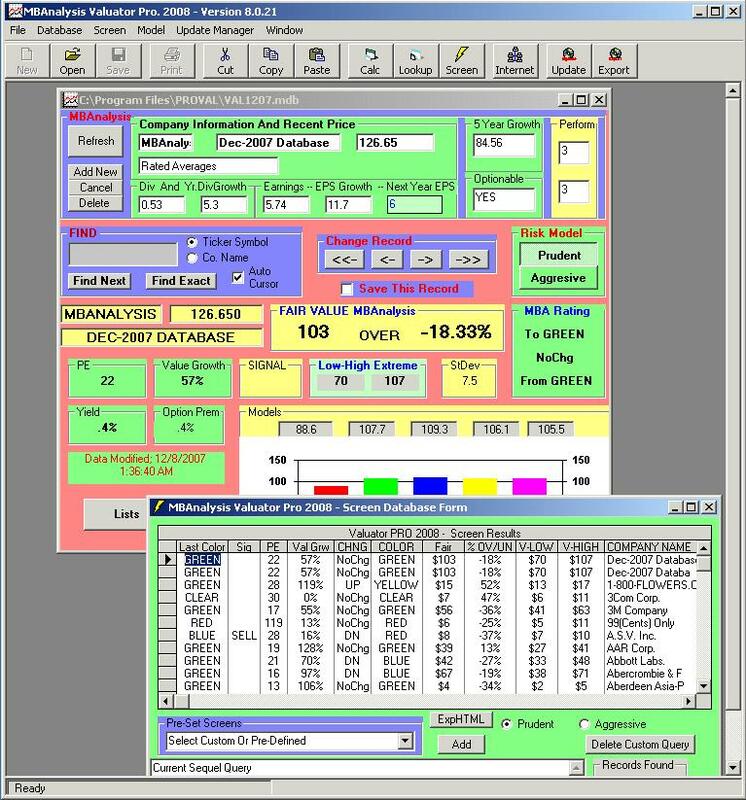 Save Back To Database Button (Available only from SCREEN WINDOW Activated Windows) Allows use of Calculator Window to modify data in a screen window that contains data already populated. You may change an individual issue in your populated screen and then store the new values back in the populated data table. Exact: Find Exact will look for the exact contents of the Find Box. If no exact match is found, the data pointer will remain on the currently selected record. Next: Find Next will move to the next record containing the characters entered in the Find Box. If no other record exists later in the database the record will remain unchanged. The Refresh Database Button will reload the current database and reflect the addition of new records. When the update manager adds new records those records might not appear in currently open windows. Open The Database For Screening: Click on the window to Open a Dialog Box and select the Database You Wish To Connect to the Screen Window. Select the Location for the Valuator Pro Compatible Database You wish To Open. Select the Database by clicking on the appropriate file name with your mouse or pointing device. Then Press ENTER or Click the OPEN button to open the database. If the INPUT Data has not already been calculated you will need to POPULATE The Database in order to have Valuation Data to screen. Select Yes To Populate. Depending on Machine Processing Power and Database Size, This operation may take Several Seconds Or Several Minutes. You will see Results appearing in the screen window as they are being calculated, But You Must Wait For The Process To Complete Before proceeding to screen or filter the data. You may Monitor the progress of the calculation By noting the Progress on the RED Needle Gauge at the Bottom of the Control Center Window. Once the operation is complete Your data is ready to Filter To select the Stocks That Meet Your Criteria. Select Custom Or Pre-Defined Screen; Valuator Pro provides a number of pre defined screens to help get you started. As you become aware of the general method to filter the data you may Set Your Own Custom Filter Criteria. Note how the filters are produced by viewing the contents of the Current Sequel Query Box at the bottom of the screen window. Select one of the pre-defined Screens Or Custom screens you have available in the Database To which you are connected. REMEMBER-- Each Database may contain its own custom Screens that you have created and saved. All Databases will have Pre-Defined Screens Available. Select NONE to remove all filtering criteria in effect and return the complete set of Data. Press ADD Button to Display the Custom Query Builder. The Valuator Query Builder window will allow you to build simple or Complex SEQUEL based queries to Run Against the Database. Building Sequel Queries can be a tricky proposition. You should study the Pre Defined queries included with the Valuator Pro to Help get you started with building your own custom queries. The order and LOGIC of your query can greatly affect the OUTPUT Recordset you Receive Including NO results for invalid queries - or those with faulty logic. Make your first queries simple, and build your complex logic in steps. Choose a field to sort the Data Query. The Select SET AS SORT Button to Place sort Field in the Sort Order Box. Press SET AND RETURN Button to SET SORT FIELD. REMEMBER -- to specify ASCENDING or DESCENDING sort or the sort will default to ASCENDING. Now Press RUN to Run the query on the database. Building a sequel query can be complex, in order to provide the filtering that a user desires. Let us walk through the construction of a Sample Sequel Query against our Database. Let us suppose that we wish to filter for the stocks that have been upgraded to a Green OR Yellow MBAnalysis Color Designation AND have a PE of less than or equal to 20 - AND are also Not rated sell. This simple query against the database can be built with the Valuator Pro Query Builder. First Open a Valuator Pro Screen window and attach a Valuator Pro compatible database. If the Database has not been populated, then you must populate before the data for the securities will appear in the window. Once data is visible we are ready to begin. Press ADD button to open the Query Builder. Press the down arrow next to the input box under QueryField. Select from the drop down list the first field to filter. Highlight COLOR. Set the Field comparison to "=" which may already be highlighted. For use of another comparator (Comparison Operator), scroll down and highlight the appropriate comparator. Place the Cursor (with a mouse click in the box) Then type in the value green. Press APPEND TO QUERY OR SORT Button. The words [COLOR] = 'green' will appear in the Query Box. Now we will repeat the process for yellow. You will notice that the AND has been selected. We Must Change this to OR Because GREEN OR YELLOW meets our criteria. Press the down arrow next to the input box under QueryField. Select from the drop down list the first field to filter. Highlight COLOR. Set the Field comparison to "=" which may already be highlighted. Place the Cursor in the Value Box (with a mouse click in the box) Then type in Yellow. Press APPEND TO QUERY OR SORT Button. The words [COLOR] = 'green' OR [COLOR] = 'yellow' will appear in the Query Box. Now we will filter for the stocks that have a PE of less than 20. Since a stock can have a negative number for the PE if the Earnings are negative, We must perform a TWO STEP process that will produce those PE's that are GREATER THAN 0 AND LESS THAN OR EQUAL TO 20. Next We want to exclude all issues that may be rated as SELL. Press the down arrow next to the input box under QueryField. Select from the drop down list the field to filter. Highlight Mech_Signal. Set the Field comparison to "<>" by highlighting. Place the Cursor (with a mouse click in the box) Then type in DN. Press APPEND TO QUERY OR SORT Button. The words [COLOR] = 'green' OR [COLOR] = 'yellow' AND [Price_Earn] <= 20 AND [Price_Earn] > 0 AND [Mech_Signal] <> 'DN' will appear in the Query Box. To Finish, we now want to set the Order of the output by the Most Undervalued. Click The Check box for SET FIELD AS THE SORT FIELD AND ORDER. The Red Words SORT ORDER will now appear below. Choose Ascending or Descending with your pointer device. To Order the MOST UNDERVALUED FIRST on our list we must Select DESCENDING, so that Over Valued - Negative AVG_Pct's will be at the bottom of our list and Positive Under Valued will appear at the top of our list. Press the down arrow next to the input box under QueryField. Select from the drop down list the field to filter. Select AVG_Pct. Now Press SET AS SORT FIELD Button. Now Press SET AND RETURN Button. You will see [AVG_Pct] DESC appear in the sort order box. Since we are now finished, Press the SET QUERY AND EXIT Button. The query Builder will close and we will be placed back to our Screen Form Window with our Query in the Query box. Press RUN Button to check the query for a valid set of Output Records. If no Records appear, there may be a fault in the query or in the logic structure. You May carefully edit the Query window directly if the mistake is apparent. Otherwise Press ADD to Re-Build your query again, and repeat the process to obtain a valid output recordset. If you wish to save your Query In The Database for future use, Then Press SAVE NEW QUERY Button. An input box will appear with a default Query Description Name. You may type in your own name or use the default presented. Press OK if done. The Word "Custom" will be inserted as a prefix to your name and will appear on the Pre-Set Screens Drop Down Box. Now Select your query if you did not already RUN it, by clicking the Pre-Set Screens Down Arrow and selecting the name you just saved. This will Run your Custom Query on the database. The results will appear in your Screen Window. Your Custom Query Is Now Finished And Has Been Stored In The Currently Connected Database For Future Use. The OUTPUT results for your screened data may be exported or Printed to the system default printer. You may Output directly to an HTML file for publication on your web site, or to a text file ( ASCII or CSV) for use in your spreadsheet or word Processor. HTML and ASCII file may be output simultaneously by selecting both modes. When prompted for a file name, the same name will be used for both files with the appropriate File Extension (.HTM or .TXT). Your output results may also be directed to your System Default Printer by selecting the appropriate report format and pressing the print button. Single Ticker Reports: Single Ticker Reports may be printed to your system printer from any Valuator Pro Calculator or Lookup Window. Single Ticker reports include data Input Assumptions As Well As Valuation Results. Although Single ticker reports may NOT be Printed From A Screen Window, you may select a symbol in the Screen Window with a single click then double click to open a Calculator window. The window that opens will contain the ticker you selected, and you may print the single ticker report to your printer. When you first start the Valuator Pro UPDATE MANAGER The Control Window is Opened and presented. Only One Instance Of the Update Manager is allowed. This window may be operated in conjunction with the Valuator Pro, or Remain open after The Valuator Control Center has been closed. This allows the user to program Immediate or Preset Scheduled updates. For All Updates, it will be necessary to set the Data Input Source and Valuator TARGET Database. You may use Microsoft Access Database sources or ASCII Text Files for input, assuming that the column headings or Profile Entries fall within the Possible Data Field Descriptors. All Target Files Must Be Valuator Pro Compatible Microsoft Access Files such as those produced by the Valuator Pro, or MBAnalysis Update Diskettes or Downloaded From Our Web Site. ASCII Text Files and CSV(Comma Separated Variable): Data may be merged or added to the database by the use of Simple Text Files. These files can be produced by almost any Spreadsheet Program as Output. This allows you to produce a wide range of imported data for your own use. DATA PROFILE FILE : This is a Simple Text File, produced by such common programs as Windows Notepad, that contains a single field name on each successive line representing the order of the data contained in the columns of the INPUT DATA FILE. These Profile Files are necessary to tell the Valuator Update Manager What to expect to see from the Input Stream of data contained in your Update Input File. These files are not necessary when you use the ACCESS type file, as this information comes from the FIELD DESCRIPTORS contained in the database file. You may of course achieve a complete and thorough update of your data By using a Valuator Pro Compatible Data Update File. These Database Files Are Available From MBAnalysis and may be provided as Data Update Diskettes or Downloaded from the MBAnalysis Web Site. Be sure to check The Valuator Pro Users Area at www.mbanalysis.com For a listing of available Databases, End Of Day and End Of Week Price Update Files, Sample Data Profile Files and Program UPDATES. Select the TYPE of Source File To be Used. Select either an ACCESS type Data File Or An ASCII Type Of Data File. ACCESS INPUT: Choosing the ACCESS Type of DATASOURCE will Offer you an OPEN FILE type dialog box. Double Click the Database Source File name or Highlight the File Name and Press Enter. Use The DropDown Box To Select the desired table within the ACCESS Database. This Input File Must Contain Fields That The Data Updater Will Recognize. See RECOGNIZABLE DATA FIELD DESIGNATIONS For a List of Field Names that the Valuator Pro Will be able to process form the input table contained in the ACCESS Input DATABASE. Profile Files are used to set the data expectations for ASCII TEXT and CSV Files. Field Names in the ACCESS file contain this information. You will see the listing of the Database Fields found in the table by looking in the Import Fields Box in the Valuator Update Status Window. ASCII File Input: For ASCII Input You Must Set A Profile And a Text Input File. Profile Files are used to set the data expectations for ASCII TEXT and CSV Files. Each Field Name in the ASCII file is listed on a separate line in the Profile File. When you open a Profile File that contains Valid Field information, you will see the listing of the Database Fields found in the file by looking in the Import Fields Box in the Valuator Update Status Window. Selecting The ASCII data Input File: Pressing The OPEN TEXT button in the Ascii Database - SOURCE Window will allow you to choose the Source for the Raw Data To Update Your Database. The PROFILE FILE should List EACH COLUMN OF DATA contained in the Input Stream Including the Designation SKIP where data in that column is to be ignored. The Example Below Uses CSV Data To Update Each Of The Symbols With The Latest Price Information. Each Column Contains a FIELD of data as Listed In the Profile. Each Line Contains Data For the SYMBOL in the database to be updated. THE TICKER SYMBOL SHOULD ALWAYS BE THE FIRST FIELD IN YOUR INPUT. Although this is not necessary when using ACCESS database files. Setting The Target Database For Update: Press the SET button in the Valuator TARGET Database Window to select the Database that will receive the updated data from your Input Stream. A OPEN FILE window will allow you to find your database and select the appropriate location. Update Options: Sets the way the Update Manager will treat the Symbols Found In The Input Stream as well as Valuation Output Calculation method. Update Existing Symbols: Symbols found in the TARGET DATABASE will be updated if they are contained in the Input File. Symbols not Contained in the TARGET Will Not Be Updated or Added To the Database. the Database. If your Input Data does not contain all the Field Information for a New Ticker, Default Values will be added. You must then be sure to replace the default values with those you deem appropriate to the Newly Added Issues after the update is complete. New symbols will be added at the end of the database file. Populating a Database During Update involves intensive calculations. You should select a method consistent with your data Input File size and Target Database Size. Selecting an inefficient Choice, may result in significant update time. It is best to tailor the Method to produce the most time - efficient result. Do Not Populate : The Fastest method for updating is to Update the Data Without Populating During the Update Process. You may then populate the Valuation data at a later time. Populate While Updating: Using this option will Update the target database and Populate The Valuation Tables in the database as Each Symbol Receives a New Field Of Data. This is appropriate when a very small amount of data is to be Updated. For a very few symbols in the Input file, this will allow ONLY the new issues to be Re-Calculated. Using This Method with a large Input File WILL BE A VERY SLOW PROCESS. It is better to use the Do Not Populate or Populate After Update For Large Input Files. This will Postpone or Perform a Complete Recalculation on the Full Database after the Input data has been added to the database. Populate After Update After the Input Data has Updated the Database, All Symbols in the Database will be re-calculated. This is the same as Selecting Populate From the Drop Down Menu for a Screen Window. This process will take a few seconds for a small database, or a few minutes for larger Target databases. Click the START UPDATE button AFTER you have entered values for the DATA INPUT (ASCII Files Need A Profile And INPUT File Set) and TARGET DATABASE designations. This will begin the Updating process according to the options you have selected. When Complete, You Will See A STATUS - IDLE appear in the CURRENT FILES IN PROCESS Box In The VALUATOR STATUS AREA. Indicating The Data Update Operation Has been Completed. The Data Stream Box Will show the current Input Ticker Symbol after the words Data Stream during the Updating Process. This will Indicate The Current Ticker in process. The Box Below will contain the input data and the Field for Update. You may examine the contents of this box in the event of an early termination of the data update process. This can happen when the input file contains data that the updater cannot process. You will be able to Identify where the update ended and correct the input file fields. This window will change every few tickers, but you may scroll down to see Input Data stream. Valuator Pro may be set to perform periodic Updates throughout the trading day at intervals specified. If a new file is present, the Update manager will perform the update as specified in your Data Input and Target Database settings. If a New file is NOT present the Update Manager will skip the update and wait the specified interval to check for the presence of a new file. Valuator Pro may be set to perform Updates at a specific time at the end of the trading day as well as at intervals specified during the day. If a new file is present, or the first update is scheduled, the Update manager will perform the update as specified in your Data Input and Target Database settings. If a New file is NOT present because it was updated at a prior time, the Update Manager will skip the update and wait the specified interval to check for the presence of a new file. Previous: Will indicate the Previously completed update and the time of completion. Time will indicate the last check for a new update file. If the Next check occurs before NEW DATA has been placed in the Input File The Update Will Be SKIPPED. This will be displayed Until New Data Causes the Update Manager to perform another update. Scheduling Interval Updates: You may specify a Time Window to check for new data. This will allow the Update Manager to Monitor and Automatically Update when the New data is found. Day: Set the Days Of the Week for the manager to schedule updates. When you start the Update Manager Today will be checked automatically. If you intend to leave the Manager operating for longer periods of time and wish it to perform its checks on a daily schedule, check each day of the week for which operation is desired. Hour - INTERVAL - Min: Specifies the INTERVAL in Hours and Minutes at which the manager will Repeat The Check for New Data. Hours may be set for 0-23. Minutes May Be set from 0-59. Remember To allow enough time for the Update To Finish Before Attempting The Next Check. Set: Will Cause the TIME In the Automatic Interval Schedule To Be Set. The Monitoring will begin when you press the START button within the Interval set. Once Started the Button will Change to STOP. This will allow you to terminate the Update Interval Monitor, and reset the times or Reset The Source and Target Files for update. Start: Scheduled Monitoring will begin when you press the START button. A Check for Available data will begin within the Interval set. Once Started the Button will Change to STOP. DATA INPUT and Target Database Box Will Dim. You Must STOP the Monitor to Reset The Source and Target for the Update. Stop: This will allow you to terminate the Update Monitor, and reset the Day, Start, Stop and Interval Time, or Reset The Source and Target Files for update. You may open As many Valuator Pro Windows as your system resources will allow. However, your windows operating system may prevent you from opening more than ten simultaneous instances of a database connection. This limitation is due to Windows Operating System limit of 10 instances of an access database opened and in use. This includes instances of Update Manager as well as Calculator, Lookup and Screen. Your system may be licensed for more than 10 instances in which case your limit will be determined by your windows configuration. In most cases this will not prove to limit the usefulness of the Valuator Pro. Arranging Windows In The Control Center. Arranging Windows: You May Tile, Cascade or Arrange Icons from the Window Drop Down Menu When A Screen, Calculator or LookUp Window has the current focus. If A Message Appears Asking To Replace Exiting Files, Be Cautious Not To Overwrite Any Windows Files That May Be Used By Other Programs. It Is Safe To Overwrite Anything In The \VALPRO Directory. If A Message Appears Asking To Replace Exiting Files, Be Cautious Not To Overwrite Any Windows Files That May Be Used By Other Programs. It Is Safe To Overwrite Anything In The \Program Files\PROVAL Directory. Go To Your Control Panel And Select ADD/REMOVE PROGRAMS. Select Valuator PRO And Then Select Remove. You May Rename The Database File PPLS.mdb To Another Name. Then When You Restart The Valuator PRO Program The User Database Will Become The Active Database. The User Database PPLU.mdb May Be Manipulated By The User With Other Programs Capable Of Reading Access Databases. The Following Fields Are The VALUATOR PRO COMPATIBLE Field Designations Contained In The Valuator Pro Database Input Table which must be named COMPWKS. These Are Used For Input File Profile File Descriptors For Update Input. In Addition To The Specific FieldName In Bold Typeface, They May Also Be Represented By The Alias Designations As Noted Below Each FieldName. ACCESS INPUT Database Fields Should Be Designated By The FieldName ONLY. Manually Created TARGET Input Table Database Fields Must Be Designated By FieldName ONLY. The Input table COMPWKS must contain all fields except "SKIP" which is only used in Profile Files. ASCII Text INPUT files used to update the Target may use Either the Correct FieldName or the listed Alias Name. All Other INPUT Fields should Be Designated as "SKIP" Fields For Use In The PROFILE FILE. "PRJ_3-5_YR_APRECIATION", "PRJ_35_YR_APRECIATION", "PRJ35", "5YR", "GROWTH"
"RECENT_PRICE", "RECENT _PRICE", "RECENT__PRICE", "LAST", "PRICE", "CUR_PRICE"
"INDUSTRY_RANK", "INDUST_RANK", "INDRANK", "RANK", "INDUSRYRANK"
"NXT_YR_EPS", "NYEPS", "EPSNY", "NXTYR", "NXTEPS"
"INDUSTRY_NAME", "IND", "INDUSTRY", "INDUSTRYNAME", "INDUSTRYGROUP"
"PCT_OF_PORT", "PCT", "PICT", "PICTURE", "PCTFILE", "PICTUREFILE"
"LASTCOLOR", "LST", "LSTCOLOR", "PREV_COLOR", "PREV", "LAST_COLOR_DESIG"
Screen Filter Name: " NONE "
Sequel Query = " SYMBOL IS NOT NULL;"
Screen Filter Name: "SPECULATIVE STOCKS SCREEN "
Sequel Query = " Mech_Signal = 'Buy' ORDER BY AVG_Pct DESC"
Screen Filter Name: "PRUDENT VALUE OPPORTUNITIES SCREEN "
Sequel Query = " Last_Color_desig IN ('YELLOW','GREEN') AND Price_Earn <= 12 AND Value_Growth_Rate > 1.5 AND COLOR IN ('YELLOW','GREEN') AND AVG_Pct > -.12 AND STD_LOW > 5 ORDER BY AVG_Pct DESC"
Screen Filter Name: "RISK ADVERSE STOCKS SCREEN "
Sequel Query = " Last_Color_desig IN ('YELLOW','GREEN') AND Price_Earn <= 12 AND Value_Growth_Rate > 1.5 AND COLOR IN ('YELLOW','GREEN') AND AVG_Pct > -.12 AND STD_LOW > 5 AND Color_change <> 'DN' AND YR_DIVIDEND > 0.0 ORDER BY AVG_Pct DESC"
Screen Filter Name: "AGRESSIVE OPPORTUNITIES STOCK SCREEN"
Sequel Query = " Mech_Signal = 'Buy' AND Color_change <> 'DN' AND COLOR <> 'RED' ORDER BY AVG_Pct DESC"
Screen Filter Name: "DEFENSIVE VALUE STOCKS SCREEN "
Sequel Query = " Price_Earn < 13.7 AND COLOR >= 'GREEN' AND COLOR <> 'RED' AND YIELD > .024 AND AVG_Pct >= -.122 ORDER BY AVG_Pct DESC"
Screen Filter Name: "SHORT SHOTS STOCK SCREEN "
Sequel Query = " Color_change = 'DN' AND COLOR = 'RED' AND AVG_Pct < -.13 ORDER BY AVG_Pct"
Screen Filter Name: "OVERSEAS OPPORTUNITIES SCREEN "
Sequel Query = " IndustryGroup LIKE ""For*"" ORDER BY AVG_Pct DESC"
Screen Filter Name: "UPGRADES and DOWNGRADES SCREEN "
Sequel Query = " Color_change IN ('UP','DN') ORDER BY Color_change DESC , COLOR DESC"
Screen Filter Name: "INDUSTRY CUSTOM SCREEN ON: "
Sequel Query = " IndustryGroup LIKE """ & SqlValue & "*"""
Screen Filter Name: "Pension 401-K And IRA Possibilities"
Sequel Query = " Last_Color_desig IN ('YELLOW','GREEN') AND Price_Earn <= 12 AND Value_Growth_Rate > 1.5 AND COLOR IN ('YELLOW','GREEN') AND AVG_Pct > -.12 AND STD_LOW > 10 ORDER BY AVG_Pct DESC"
Screen Filter Name: "BUY STOCKS SCREEN "
Screen Filter Name: "SELL STOCKS SCREEN "
Sequel Query = " Mech_Signal = 'Sell' ORDER BY AVG_Pct"
Screen Filter Name: "100 MOST UNDERVALUED SCREEN "
Sequel Query = "SELECT TOP 100 * FROM COMPNPV WHERE SYMBOL IS NOT NULL ORDER BY AVG_Pct DESC "
Screen Filter Name: "100 MOST OVERVALUED SCREEN "
Sequel Query = "SELECT TOP 100 * FROM COMPNPV WHERE SYMBOL IS NOT NULL ORDER BY AVG_Pct ASC "
Screen Filter Name: "BEST OF THE BEST STOCK SCREEN "
Sequel Query = " Mech_Signal <> 'Sell' AND Color_change = 'UP' AND COLOR = 'YELLOW' ORDER BY AVG_Pct DESC"
Screen Filter Name: "BEST NOW STOCK SCREEN "
Sequel Query = " Mech_Signal <> 'Sell' AND COLOR = 'YELLOW' ORDER BY AVG_Pct DESC"
Screen Filter Name: "100 HIGHEST PE STOCK SCREEN "
Sequel Query = "SELECT TOP 100 * FROM COMPNPV WHERE SYMBOL IS NOT NULL ORDER BY Price_Earn DESC"
Screen Filter Name: "100 LOWEST PE STOCK SCREEN "
Sequel Query = "SELECT TOP 100 * FROM COMPNPV WHERE Price_Earn > 0 AND Value_Growth_Rate > 0 ORDER BY Price_Earn ASC"
Screen Filter Name: "100 HIGHEST VALUE GROWTH STOCK SCREEN"
Sequel Query = "SELECT TOP 100 * FROM COMPNPV WHERE Price_Earn > 0 AND Value_Growth_Rate > 0 ORDER BY Value_Growth_Rate DESC"
NEITHER MB Analysis, MBA Financial Publishing, Inc., NOR ANYONE ELSE INVOLVED IN CREATING, PRODUCING, OR DISTRIBUTING THIS PRODUCT WARRANTS THAT IT WILL SATISFY YOUR REQUIREMENTS FOR INVESTING OR THAT THE PRODUCT WILL BE ERROR-FREE. THIS PRODUCT IS DISTRIBUTED "AS IS" WITHOUT WARRANTIES OF ANY KIND, EITHER EXPRESSED OR IMPLIED, INCLUDING BUT NOT LIMITED TO WARRANTIES OF MERCHANTIBILITY OR FITNESS FOR A PARTICULAR PURPOSE OR USE. NEITHER MB Analysis, MBA Financial Publishing, Inc., NOR ANYONE ELSE INVOLVED IN CREATING, PRODUCING OR DISTRIBUTING THIS PRODUCT SHALL BE LIABLE FOR ANY DIRECT, INDIRECT, INCIDENTAL, SPECIAL, CONSEQUENTIAL OR PUNITIVE DAMAGES, LOST PROFITS, LOST OPPORTUNITIES OR LOST SAVINGS ARISING FROM THE USE OF THIS PRODUCT. NO PART OF THIS MBAnalysis VALUATOR SOFTWARE MAY BE COPIED OR DISTRIBUTED, TRANSMITTED OR TRANSCRIBED, STORED IN A RETRIEVAL SYSTEM OR TRANSLATED INTO ANY LANGUAGE, IN ANY FORM OR BY ANY MEANS, ELECTRONIC , MECHANICAL, MAGNETIC, MANUAL OR OTHERWISE DISCLOSED TO THIRD PARTIES WITHOUT THE EXPRESSED WRITTEN PERMISSION OF MBA Financial Publishing, Inc..
MBA Financial Publishing, Inc. AND OR PERSONS OR ENTITIES CONNECTED OR RELATED TO IT MAY BUY OR SELL OR MAY HAVE BOUGHT OR SOLD ANY ISSUE OR ITS DERIVATIVE MENTIONED IN ITS REPORTS. NO PERSON OR ENTITY CONNECTED TO MBA Financial Publishing, Inc. OR THEIR FAMILIES RECEIVE OR WILL RECEIVE CONSIDERATION FOR PLACING OR OMITTING DATA IN THIS REPORT. MBA Financial Publishing, Inc. RESERVES THE RIGHT TO REVISE THIS VALUATOR SOFTWARE AND TO MAKE CHANGES FROM TIME TO TIME IN THE CONTENT HEREOF WITHOUT OBLIGATION OF MB Analysis TO NOTIFY ANY PERSON OR ORGANIZATION OF SUCH CHANGES. FACTUAL MATERIAL IS NOT GUARANTEED BUT IS OBTAINED FROM SOURCES THAT ARE CONVENTIONAL AND BELIEVED TO BE RELIABLE. Stock Investors - Select Value Stocks! Avoiding A Single Mistake Could Save You Many Times The Cost Of The Valuator PRO. 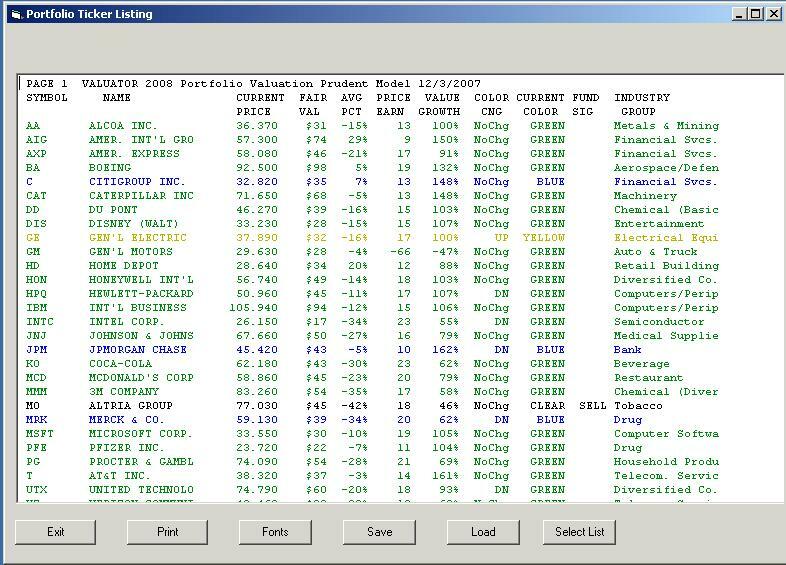 Select Value Stocks That Meet Your Criteria. Screen, Print, Or Export Your Results. Even Publish To Your Web Site. THE ULTIMATE VALUE STOCK SELECTION TOOL! Internet Resources and On-line Tools To Help Refine Investment Decisions. CD-ROM Or 3 1/2" Floppy Disk Drive. Ó 1998-2008 MBAnalysis. All Rights Reserved. Valuator PRO Ver. 2008 is distributed on CD-ROM Version for the x86 platform is available directly from MBA Financial Publishing Inc.